If you have even the smallest idea what your song is about, you can guess the broad tone and mood of your song. 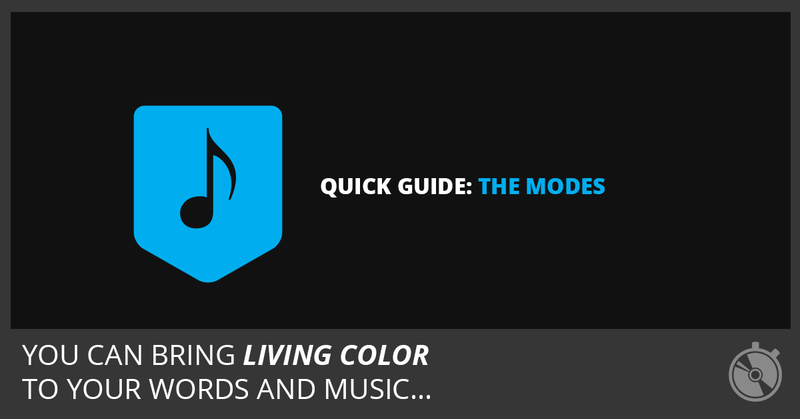 Your song’s mood should suggest one or two modes. You can pull chord progressions and melodies from these modes to begin your songwriting. When you narrow your options to only the best modes for the song, you give your songwriting a clear direction. You also save yourself from losing momentum and inspiration! Lydian is bright. It has one altered note from the neutral Ionian mode, the raised 4th scale degree. Ionian is neutral. It’s the basic major scale every musician knows (or should know). When I say the other modes have altered scale degrees, I’m comparing them to this mode. Mixolydian has a lowered 7th scale degree. It’s less bright than Ionian and hasn’t quite reached the dark status of Dorian. Dorian has a lowered 3rd and 7th scale degree. The minor third gives it a darker edge. Aeolian has lowered 3rd, 6th, and 7th scale degrees. It’s darker than Dorian and brighter than Phrygian. Phrygian is the darkest mode. It has lowered 2nd, 3rd, 6th, and 7th scale degrees. It isn’t used much in pop but it’s heard in heavier or dark and moody sounding music. It’s pretty safe to skip the Locrian mode unless you want to experiment. Locrian has lowered 2nd, 3rd, 5th, 6th, and 7th scale degrees. Ionian, Lydian, and Mixolydian are the major modes. Dorian, Aeolian, Phrygian, and Locrian are the minor modes. A few other modes get used a lot: Major Pentatonic, Minor Pentatonic, Major Blues Scale, and Minor Blues Scale. With just a little exploration, you can bring living color to your words and music. Share your own “mood words” in the comments below. If you follow my songwriting method, you’ll be doing less work which gives you more time to enjoy the process of songwriting. I always am trying to learn something new about songwriting. Found this post quite interesting. I liked the word descriptions of the modes, However I found the mood order to be confusing at first as they aren’t in the order the modes fall in the scale (IDPLMAL) but once I realised the order you put them in was bright to dark only I got my head screwed on again. I’ve found these modes to be the most useful technique in the whole of my playing, so thanks!